This ten-segment video series on five tapes covers historical events from the 1930s to the 1960s, such as the 1937 Hindenburg disaster, the 1956 sinking of the Italian ocean liner Andrea Doria, and the 1963 cave-in of a Pennsylvania coal mine. The segment entitled Typhoons and Kamikaze has about five minutes on the typhoon that hit the Allied fleet in June 1945, and the remainder covers Japanese kamikaze attacks. The video has a second segment, which covers the bombing of the USS Franklin by a regular Japanese bomber rather than a kamikaze. The information given by the segment on kamikaze confuses historical facts and perpetuates myths about the pilots. This documentary gives both an incomplete and inaccurate depiction of Japan's kamikaze operations. The video's history starts in March 1945, with no mention made of the kamikaze attacks that had started in the Philippines in October 1944. The narrator makes it sound like the Allied troops off Okinawa in March 1945 could not believe a pilot would purposely fly his plane into a ship, even though kamikaze attacks had already sunk or damaged over one hundred Allied ships in the Philippines (O'Neill 1999, 131-2; Ozawa 1983, 88). 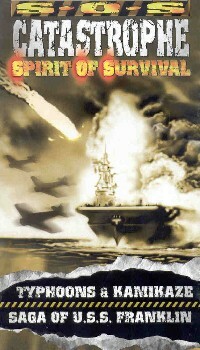 In another example of misleading information, the narrator describes the beginning of mass kamikaze attacks by hundreds of planes on the task force off Okinawa, but then the film clip shows the departure of the five planes in the first kamikaze unit in the Philippines . The video says the purpose of the Kikusui mass attacks by kamikaze planes was to stop the Allied task force preparing for the invasion of Okinawa. However, the first Kikusui attack did not occur until April 6, and the Okinawa invasion started on April 1. The video includes some interesting commentary by two men who experienced kamikaze attacks on their ships off Okinawa and by the director of the Intrepid Museum in New York City. Their comments about the American side of the battle bring realism to the video's presentation, but their opinions on Japanese kamikaze pilots do not correspond with historical facts. A survivor of the aircraft carrier Intrepid says kamikaze pilots were shackled in their planes and could not get out, so they had only the option of crashing into ships. Although it is possible this could have happened in an isolated instance, the vast majority of pilots willingly gave their lives to protect their country from the approaching enemy. Another comment is made that the pilots often had two to three hours of training prior to being sent on kamikaze attacks. Japanese pilots suffered from severely inadequate training near the end of the war, but this low number is exaggerated. Most kamikaze pilots had 100 or 200 training flight hours (Brown 1990, 53; Warner 1982, 78-79). This documentary's errors on kamikaze history make it a video to stay away from, but the other segments in this series on catastrophes provide interesting information with many historical film clips. 1. At 3:05 in video. Brown, David. 1990. Kamikaze. Greenwich, CT: Brompton Books.